Outer ear pain can most commonly be caused by environmental conditions such as water exposure or extreme cold weather that can lead to frostbite of the outer ear. Other causes for ear tragus pain include irritation from obtrusive objects like cotton swabs or fingers. Read below for more information on causes and treatment options. Outer ear pain usually begins as mild discomfort that is often worsened by pulling on the ear or pushing on the bump (tragus) in front of the ear. At the onset of outer ear pain symptoms, the appearance of the ear usually does not change. It may not look red, swollen or deformed, so initial symptoms may be easy to dismiss. However, the outer ear is more than just the cartilaginous, fleshy part used for earrings and other piercings. 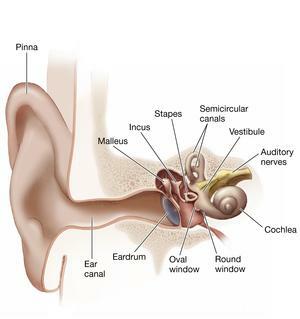 The outer ear is also composed of a canal that runs from the eardrum to the outside of the head. It is important to follow up on symptoms of outer ear pain promptly in order to get appropriate care and prevent the development of more severe symptoms and consequences. The majority of causes of outer ear pain stem from infection of the outer ear canal or otitis externa. Since the ear is open to the outside world, it is easily susceptible to infection by both bacterial and viral causes. Even though the outer ear canal has natural defenses that work to keep the ears clean and prevent infection, any condition that compromises these natural defenses can result in outer ear pain symptoms. Scratches/Abrasions: Practices such as excessive cleaning of the ear with cotton swabs or scratching inside the ear with a finger can result in breaks in the skin that allow bacteria to grow. Sensitivity: Jewelry and sometimes hair products can cause allergy and irritation to the skin that can promote infection. Conditions that result in excess moisture inside the ear canal create an environment ideal for bacterial growth. Environmental: External factors such as swimming and heavy perspiration put moisture directly into the ear canal. Repeated exposure can result in bacterial growth and future infection. Structural: Some people have narrow ear canals that make drainage of moisture more difficult. This structural anomaly causes blockage that traps water and promotes bacterial growth and infection. Devices: Gadgets that you put directly into your ear such as headphones or hearing aids can also cause blockages that trap excess water. The list below shows results from the use of our quiz by Buoy users who experienced outer ear pain. This list does not constitute medical advice and may not accurately represent what you have. At the onset of outer ear pain symptoms, seek prompt medical attention. Your doctor will treat your outer ear pain by stopping the infection and allowing the ear to heal. Drainage/Cleaning: Your doctor will use suction or a small device to drain water and clear away debris, earwax or extra skin. This is necessary to allow for the next step, the antibiotic eardrops, to move freely through all infected areas of the ear. Depending on the extent of blockage or swelling, your doctor may insert cotton or gauze in the ear to promote drainage instead. Ear-drops: Your doctor will prescribe ear-drops with a combination of ingredients that fight bacteria and fungi. These will also reduce inflammation and help restore your ear's normal pH balance. Pain medication: To ease the outer ear pain symptoms, your doctor may suggest over-the-counter non-opioid pain medications. During treatment make sure to take your eardrops as prescribed. Avoid getting water in your ears (even during showers) and do not use headphones, hearing aids or earplugs until pain or discharge has stopped. In order to prevent outer ear pain symptoms from occurring, there are many things you can do at home and change in your normal routine. Keep your ears dry: Thoroughly dry your ears after exposure to moisture from swimming or bathing. Practice techniques such as tipping the head to the side to help water drain from the ear canal and wipe the outer ear slowly and gently with a towel. Do not put foreign objects in your ear: Do not attempt to scratch or dig out earwax with objects such as cotton swabs (Q-tips) or paper clips. These items may not only irritate or break the skin in your ear, but can also pack the material deeper into your ear canal worsening blockage and moisture buildup. Protect your ears from irritants: Be conscious of the type and quality of jewelry and piercings you use on your ears. Furthermore, protect your ear canal from hair sprays and dyes by using cotton balls or other protective measures. Is there anything coming from your ear(s)? Do you use a hearing aid or wear earplugs? Do you often come into contact with hot tubs, swimming pools, or other sources of standing water? Understand your ear canal pain symptoms, including 9 causes & treatment options for your ear canal pain.